Technology Bridge (formerly ERP), located at 5000 Gulf Freeway, is a 70-acre complex which provides research and classroom space, as well as a variety of offices for the University of Houston main campus. The Petroleum Engineering Program offers classes at Technology Bridge, and various departments from IT to Real Estate have offices at Technology Bridge. 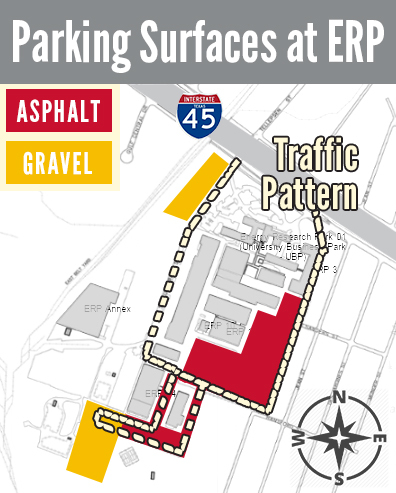 During Monday-Friday before 4 p.m., Remote Campus Permit holders may park at Technology Bridge only. 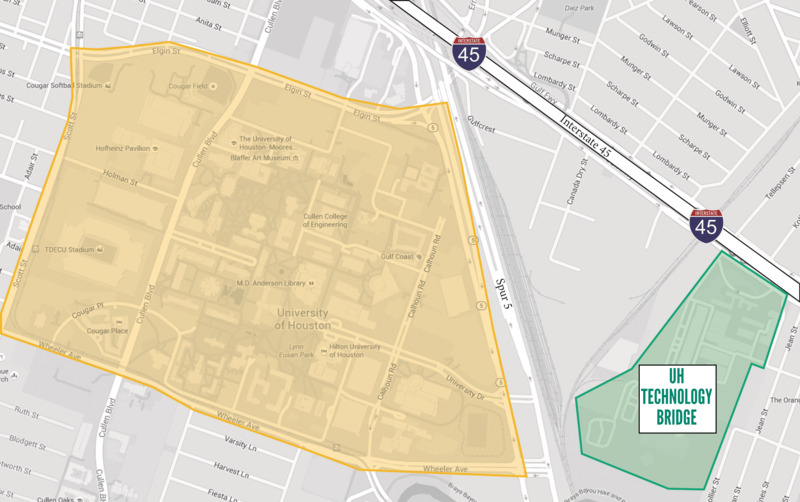 Faculty, staff and students with other permit types are allowed to park in the back of Technology Bridge at any time to allow access to this vital UH campus location. Technology Bridge is located at 5000 Gulf Freeway, within a mile of the University of Houston main campus. Click the image below to get a better idea. Take the Telephone road exit and stay in the right lane of the I-45 Northbound feeder road. Go straight through the traffic light at Telephone road. You will pass a Luby’s Cafeteria. Do not go through the Schlumberger St. underpass. Bear right before the underpass on the road that forks off marked Tellepsen/Schlumerger. Turn Left on Schlumberger and go under I-45 and turn left again to get on the I-45 Southbound feeder road. The University Business Park complex will be on you right. Take the Cullen exit (44C) and stay on the I-45 Southbound feeder. You will travel roughly a half of a mile down the feeder past the UH Central Campus until you pass through the Schlumberger St. underpass. When you come back up the University Business Park complex will be on you right. How do I get to campus from ERP? The Cougar Line shuttle provides continuous service between the main campus and ERP via the Student Center-ERP route and the PGH-ERP route. M-Th: 6 a.m. until 11 p.m.
Friday: 6 a.m. until 9 p.m.
Shuttles run approximately on a 12-minute frequency. 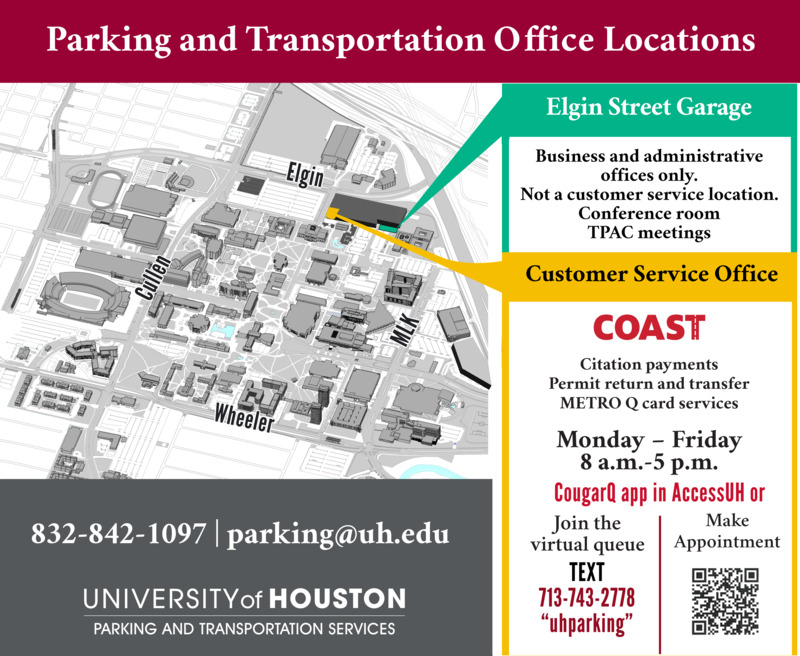 The image below highlights areas where Remote Campus permits are permitted to park in and around ERP.